Hot summer does not want to wear clothing with a complicated cut and many decorative details. Modern fashion trends bigger emphasis on the beauty of natural fabrics and the simplicity. Sundress – traditionally, summer clothing, its loose cut involves the use of lightweight fabrics, colourful large patterns or drawings. It is possible to add a belt or a strap, allowing you to emphasize a thin waist and slender figure. Measure the width of the back and chest. Transfer the pattern top sundressand on paper, taking into account these parameters and cut out the material for the two parts A, b and C. It will be the yoke and straps of your future dress. Vykroyte two trapezoids with a height of 1 meter. Length of the lower base is 90 cm, the upper base of the trapezoids make a different. 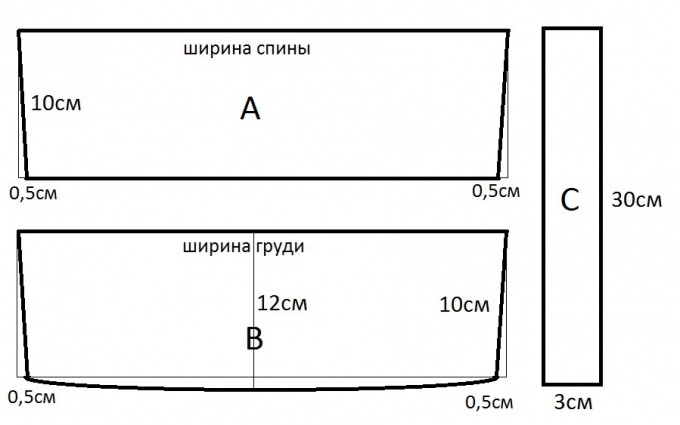 For the back panels of the sundress, it must be equal to the width of the back plus 2 cm, and for the front – half of the circumference of the chest plus 6 see don't forget to add 1 cm on all sides of the pattern at the seams. Prostrochite upper rear cloth of the sundress long stitch and probarte width of the yoke. Fold both details of the back yoke (part A) wrong side out, put them between the rear panel sundress and prostrochite, departing on the seam width. In the front panel make a couple of large pockets on each side, departing from the middle of the part At 5 cm Adjust their depth to width of top of front cloth coincided with the width of the bottom edge of the front yoke. Fold both details of the front yoke (part C) wrong side out, insert between the front panel of the dress and stitch, departing the width of the seam. Sew side seams, starting from the top of the dress, iron them and align length. Hem hem, departing at 2 cm Fold the part in half, long edges, tuck in and attrocity detail on the longest side with two sides. Top front and back yoke prometiste hand-stitch, with tucked edge detail and inside. Mark the location and adjust length of straps of the sundress. Put them between the parts of the rear and front of the yoke, slightly podporou seam, made by hand. Secure with basting and then attrocity top seam, departing at 0.1 cm from the edge. Pattern long sundress. To sew a summer sundress. That is the goal for millions of women in Russia at the beginning of each summer. We help You with this case and put for free download the pattern sundress. This is one of the huge number of patterns sundresses on our website, which is available for free download. Patterns dresses. Summer knit dress (sundress) Empire for full large size with drawstring and narrow welts. Long summer sundress best stitching chiffon with large floral pattern. Chiffon – transparent material, and probably not everyone is comfortable wearing such clothes, but there is a solution. Sew the bottom dress for our pattern and the problem will be solved.